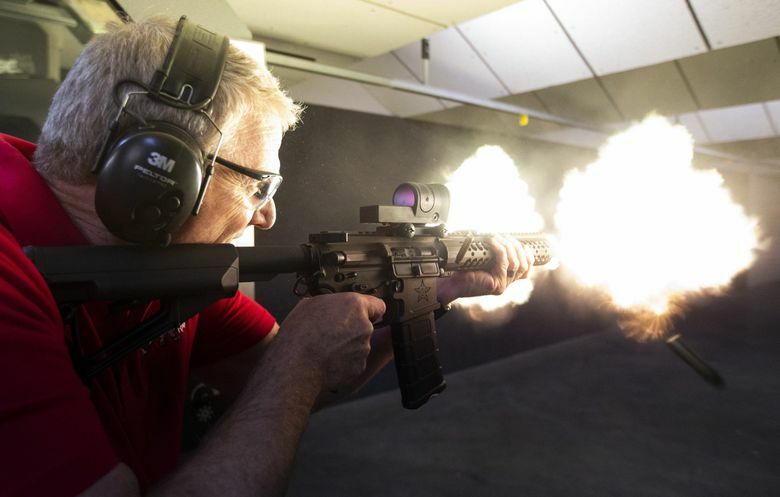 “I think it’s a bad law and I think it violates people’s rights,” says Sheriff Bob Songer of I-1639, the law putting stiff requirements on the sale and ownership of semi-automatic rifles. YAKIMA — Klickitat County Sheriff Bob Songer says he’s not enforcing the state’s new initiative that places stiff requirements on the sale and ownership of semi-automatic rifles such as AR-15s, calling it unconstitutional. Initiative 1639 — approved by voters statewide in November — raises the age to purchase a semi-automatic rifle from 18 to 21, calls for enhanced background checks, and requires buyers to complete a firearm safety course. The initiative also holds gun owners accountable if someone else uses their firearm to harm themselves or someone else. Yakima County Sheriff Bob Udell didn’t return several phone calls seeking comment on the initiative. Not all law-enforcement agencies in the state are taking a stance as hard as Songer’s. But many are concerned about the constitutionality of the measure and the additional workload enhanced background checks will bring when the initiative takes effect in July, said Steven Strachan, executive director of the Washington Association of Sheriffs and Police Chiefs. The Lewis County Sheriff’s Office and Republic Police Chief Loren Culp announced shortly after the November general election that they wouldn’t enforce the new law. In November, the National Rifle Association and the Second Amendment Foundation filed a joint lawsuit in U.S. District Court challenging the constitutionality of I-1639. Songer sees several problems with the initiative, including age and the security requirements and placing gun owners at risk of facing felony charges if someone uses their firearm in a crime or to harm themselves or someone else. He said the age limit isn’t fair to servicemen under 21 who come home after serving in Iraq or Afghanistan, where they toted a rifle. Locking a gun up prevents a homeowner from responding quickly to a home invasion, he said. And the background checks also probe whether someone has had any mental-health problems, a violation of the Health Insurance Portability and Accountability Act of 1996, he says. Not so, says a spokeswoman for the organization the devised the initiative, Seattle-based Alliance for Gun Responsibility. The initiative only requires law-enforcement agencies to determine whether a person ever had been involuntarily committed to a mental-health facility, said spokeswoman Kirsten Ellingboe. The enhanced background checks are already required for handgun purchases. Keeping a gun locked up is an incentive, but not an enforceable piece of the initiative, she said. The intent is to make communities safer and prevent guns from falling into the wrong hands, Ellingboe said. Most law-enforcement agencies are bracing to take on the increased workload of the enhanced background checks, which now are required only for handgun buyers, Strachan said. Kittitas County Sheriff Gene Dana said his office conducts a lot of background checks for concealed-weapons permits, but the initiative adds more gun buyers to the workload. Dana said his office will comply with the initiative but use discretion in enforcing it.